This article is about video games based on the Waterworld movie. For the earlier Atari 2600 game released as part of the Swordquest series and contest, see Waterworld. Waterworld is a video game released for the Super Nintendo Entertainment System, Virtual Boy, MS-DOS, Microsoft Windows and Game Boy, based on the film of the same name, along with unpublished versions for the Mega Drive/Genesis, Sega Saturn and Atari Jaguar. These games were produced by Ocean Software. The SNES and Game Boy games were released only in Europe in 1995 and the Virtual Boy game was released exclusively in North America in November 1995. It was released for PC in 1997. The game received widespread negative reviews and the version released for the Virtual Boy is generally considered to be the worst game of its 22 releases. The game is focused around the Mariner's (the main character) trimaran, which the player moves around a 3-D world, shooting enemies on personal water crafts called Smokers. It is a form of 3D shoot 'em up, similar to that of the All-Range Mode in Star Fox 64. The objective is to keep the Smokers from grabbing Atollers (inhabitants of Atoll) placed around the playing field. To keep them from being captured, the player must shoot the Smokers using the L and R buttons on the Virtual Boy's controller while moving around with either of the two directional pads. Like all other Virtual Boy games, Waterworld uses a red-and-black color scheme and uses parallax, an optical trick that is used to simulate a 3D effect. 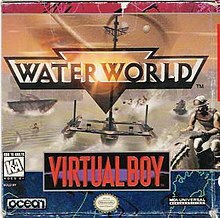 While all the other versions of Waterworld are single player only, the Virtual Boy edition supports up to nine players. Waterworld for Super NES was released in 1995 in Europe by Ocean Software. It was only released in PAL territories, but an NTSC version had been scheduled for release in December 1995, and given a lengthy review in that month's issue of Nintendo Power. The game was played from an overhead/isometric perspective with the player controlling the Mariner's boat on the ocean. The point of the game was to destroy the Smokers' boats and dive for sunken artifacts, at which point the game switches to a side on perspective so that the player can directly control the Mariner underwater. A Sega Genesis port of the Super NES version was also produced by Ocean. Planned for release in Europe in fall 1995, it was never distributed. A complete version of the game was eventually leaked on the net. The cancelled Sega Saturn version of the game was to feature a 3D virtual ocean with a dynamic surface. It began development in late 1994. In April 1995, Interplay Entertainment announced that they had garnered the rights to make a Waterworld game. The game was developed by Intelligent Games and published by Interplay. It was released for MS-DOS and Microsoft Windows personal computers in 1997. It is a real-time strategy video game. The game contains 25 missions. In the game, players play as a War Chief and lead a taskforce of 2 to 14 men depending upon the mission. The main objective of the game is to amass enough hydro (fresh water), food, weapons, and critical information to successfully evade the "Smokers" and revert the inundated world to its once former glory. Waterworld received predominantly negative reviews. GameSpot gave the PC version a review score of 4.5/10. The Virtual Boy version gathered particularly negative reviews for its poor gameplay and graphics. Sir Garnabus of GamePro panned it for having slow controls, bad collision detection, and the same enemies and victims in every level. He also criticized the lack of any backgrounds apart from the sunset, saying this mutes the 3D effect. Dave Frear of Nintendo Life claimed that the game was "crap", adding "with severely flawed visuals it can’t even gain points for impressing technically". The author of The Ultimate History of Video Games, Steven L. Kent, considers Waterworld to be the worst video game of all time. Seanbaby called Waterworld "the most horrible thing to ever be put inside a Virtual Boy". ^ a b "6 Real Video Games That Were Too Insane To Release". Cracked. Archived from the original on 2017-02-05. Retrieved 3 February 2017. ^ "Waterworld". Electronic Gaming Monthly. Ziff Davis (83): 93. June 1996. ^ "OCEAN OF AMERICA DIPS INTO 'WATERWORLD(TM)' AT E3". Nine Lives. April 25, 1995. Archived from the original on 2004-12-14. Retrieved 2018-09-29. ^ "Feature - XT Generation Report - Atari Jaguar". MAN!AC (in German). No. 20. Cybermedia Verlagsgesellschaft mbH. June 1995. p. 40. ^ "Short ProShots - Waterworld". GamePro. No. 75. IDG. October 1995. p. 165. Archived from the original on 2018-09-30. Retrieved 2018-09-29. ^ "Backwards Compatible: The Virtual Boy". ABC Good Game. 2009-06-01. Archived from the original on 2009-08-21. Retrieved 2015-04-13. ^ a b "Waterworld". GamePro. No. 88. IDG. January 1996. p. 56. ^ "Sega Gamers' Day". Electronic Gaming Monthly. No. 87. Ziff Davis. October 1996. p. 115. After spending almost two years in development, Waterworld for the Saturn is nearing completion. ^ HAMASHIGE, HOPE (14 April 1995). "Irvine Firm Picks Up Rights for 'Waterworld' Games". Archived from the original on 2016-03-07. Retrieved 2015-07-13 – via LA Times. ^ a b Dultz, Marc (2 December 1997). "Waterworld Review". Archived from the original on 2018-09-14. Retrieved 2018-09-14. ^ "ProReview Portable Systems: Waterworld". GamePro. No. 92. IDG. May 1996. p. 70. ^ Frear, Dave. "Waterworld Review - VB". Nintendo Life. Archived from the original on 2017-02-04. Retrieved 3 February 2017. ^ "History of Gaming: The Best and Worst Video Games of All Time". PBS. Archived from the original on 2011-11-03. Retrieved 2006-06-30. This page was last edited on 14 March 2019, at 20:06 (UTC).